Katie Hacker shared some tips with me for making an elastic bracelet. These tips were so good I just couldn't keep them to myself. Jennifer asks: I have a customer who is asking about making stretchy bracelets, do you have a product you like for them? She is having a hard time keeping the knots tied. I was about to make some too and we both realized that you would be the expert to ask about this. If you have any tips or product names could you let me know? Thanks for your help. Katie answers: For the stretchy bracelets... I like to use .08mm diameter because it is nice and thick but not too thick to tie good knots. I use Elasticity, which is made by Beadalon. They recommend a figure-8 knot (picture on package) to tie it, but I typically just tie a square knot. Try to put some tension on the cord while you're tying the knot, then pull all of the ends to tighten the knot once it's tied. I put a drop of jeweler's cement like GS Hypo on the knot, let it dry, then cut off any extra. If you can tuck the knot into a nearby bead, that will help protect the knot.Also, a word to the wise: remember that stretchy material is not as durable as beading wire. Stretchy bracelets are fun to make and wear but they probably aren't going to last forever. You can find Katie's blog here with more helpful tips on jewelry making. This post was written by Jennifer Jangles. You can find more about her on her blog, Jennifer Jangles. Hi Jennifer,thanks for the tip, i make the little stretchy rings for little girls at my festivals they are fun! Stretchy bracelets are how I support my bead-making habit. A couple of other tips:1) The standard size for stretchy bracelets is about 7.5 inches. I make it a fraction bigger so that it doesn't receive as much stress. 2)Make sure your bead holes are smooth;it's easy for a burr to slice through the elastic 3)Stretch magic in 1 mm has proved very durable for me. EXCELLENT post. I do the exact same things you do but I don't know how many people think you still use a crimp. 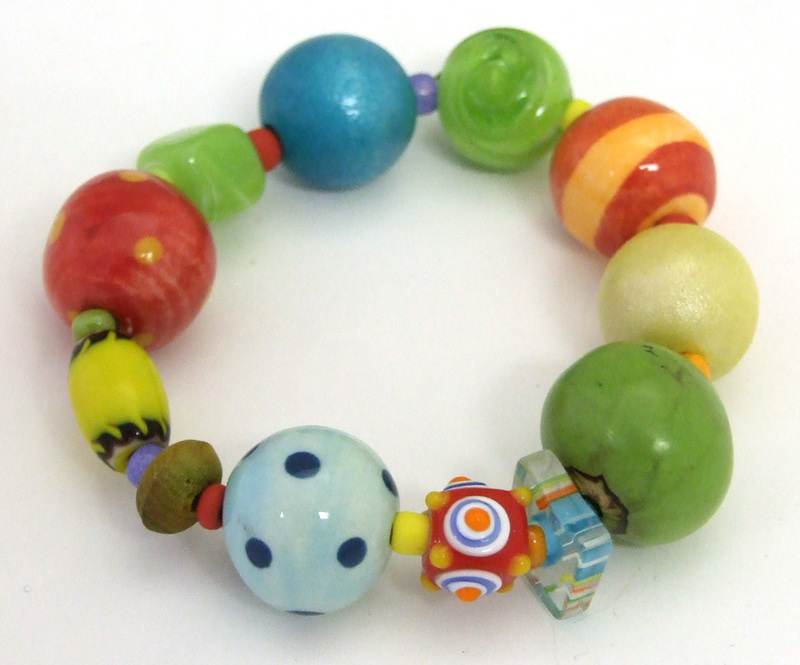 I also like to put the glue on the knot and then slide it inside a bead to dry. Voila! instant 'endless' bracelet. I did read that it is not wise to use a cyanoacrylate type glue (known as SuperGlue ere in the UK) as it will perish the elastic. A blob of clear nail varnish seems to work ok.